Beers are brewed under the name Aufsesser, April to October open every date. March and November closed Tuesday, December thru February close Monday thru Thursday. A most amazing Pils! Had I not had a couple beer experts and "geeks" along who agreed with me, I might of thought it was just me. We also tried it bottled and it seemed even more aromatic! It was a love affair, can't wait to get back. Notes from 2002 - Pils: Hoppy with sulfer, dry, assertive bitterness, long finish, good carbonation. Dunkles: sharp caramel flavor - not well integrated. Aufsesser Dunkel has a malty but alcoholic nose, with a nice rich amber color. Deep roasted malt flavor early yields to a hoppy finish and aftertaste. A slightly burnt malt character detracts somewhat from the overall impression. More like a modern restaurant with more tourists than locals behinde the glasses. 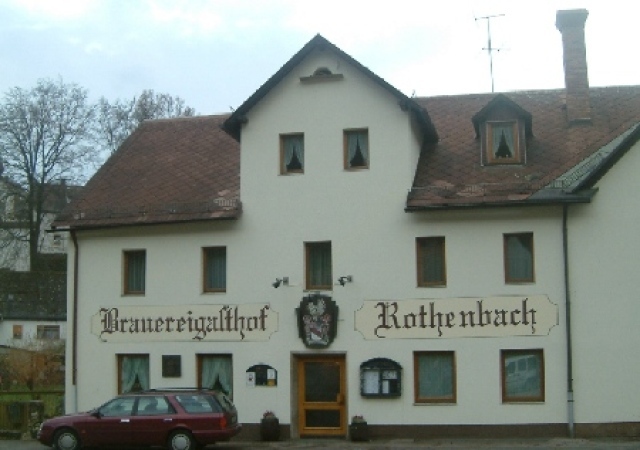 The brewery has three nice orange-brown beers - Dunkel, Festbier and Bock - with a bready maltiness and a dry aftertaste. They are quite similar, but I especially liked the Bock. In my opinion, the Wiezen and Pils have less character. Just wanted to add a review since there has not been one for several years. Visited today as part of the beer walk in this area to four breweries. It was a sunny Sunday in June. Although busy enough, this place was not nearly as busy as the others in the area -- for some reason all the motorcycle people don't have this as part of their stop. Just fine with me. The beer was typical Franconian and good. Which number is highest 76 or 18?